Background and Objectives: Repair of tetralogy of Fallot (TOF) with monocusp pulmonary valve reconstruction prevents pulmonary regurgitation (PR) for a variable period. Since postoperative outcome is governed by PR and right ventricular function, we sought to assess the severity of pulmonary regurgitation and right ventricular outflow (RVOT) gradient in the immediate postoperative period and at 1 year and attempted to identify the anatomical substrates responsible for adverse outcomes. Methods: The study included 30 patients. Transthoracic echocardiography was performed before surgery, within 5 days of surgery, and 1 year later. Presence and severity of PR, RVOT gradient, and residual branch pulmonary stenosis were assessed. Right ventricular and monocusp valve functions were studied. Results: Median age was 36.5 months (3-444 months). There were no deaths. Pulmonary regurgitation was mild in 18, moderate in 10, and severe in 2 patients immediately following surgery. At 1 year, 10 patients had severe PR and one had significant RVOT gradient. None of the variables like age, presence of supravalvar pulmonary branch stenosis, main pulmonary artery diameter, or mobility of monocusp valve was found to have any significant association with the progression of PR. McGoon index <1.5 showed a trend toward more PR, while patients with more residual RVOT gradient had lesser regurgitation. Conclusions: Repair of TOF with monocusp pulmonary valve reduces immediate postoperative PR. At 1 year, the monocusp valve underwent loss of function in a significant proportion and PR also progressed. This study could not identify any predictors of progression of PR, though patients with McGoon index <1.5 tended to have more PR while those with more outflow gradient had lesser PR. Residual pulmonary insufficiency of milder grades following monocusp valve reconstruction progresses over a course of time. The pace of progression varies and is unpredictable. The factors contributing to progression of PR are not clear. These presumed factors include fibrocollagenous incorporation of the monocusp valve, lack of proper frame for the valve, residual stenotic lesions in pulmonary vasculature, size of branch pulmonary arteries, and mobility of the monocusp. In this context, we undertook this prospective observational study to assess the severity of PR and transpulmonary valve gradient in the immediate postoperative period and 1 year after the insertion of monocusp valve. We also attempted to find out predictors of progression of PR 1 year after surgery and to determine whether the progression is inexorably related to the inherent properties and weakness of polytetrafluoroethylene (PTFE) monocusp valve or if there are potentially correctable parameters that contribute to progression of PR after this surgery. Approval for the study was obtained from the institutional ethical committee. Consecutive patients who underwent ICR with transannular patch and monocuspid valve reconstruction of RVOT for TOF for a 6-month period from 1 May 2011 were included in the study after obtaining their informed consent. Anonymity of the patients was maintained during the recruitment and analysis. Transthoracic echocardiography was performed before the surgery and the anatomy was assessed in detail. The levels of obstruction in the RVOT and pulmonary valve, and pulmonary artery and branches were determined. The dimensions of pulmonary annulus, main pulmonary artery (MPA), and right and left pulmonary arteries just before the first branch were determined and McGoon index was calculated. Pulmonary annulus z scores were not analyzed. Significant pulmonary artery stenosis was defined as an abrupt narrowing >40%  or as an acceleration of the peak flow velocity of at least 50% in one or both pulmonary artery branches compared with the MPA. Presence and severity of pulmonary and tricuspid regurgitation were assessed. RV area in systole and diastole in apical four-chamber view was obtained and RV fractional area change (RV FAC) was determined. Wherever needed, supplementary information was obtained with cardiac catheterization or magnetic resonance imaging (MRI). The patients underwent ICR under cardiopulmonary bypass. Trans right atrial closure of VSD with 0.6-mm PTFE patch was performed. MPA was opened longitudinally up to the annulus and pulmonary valvotomy done. Annulus was assessed by passing the required Hegar dilator, incision was extended across the annulus, and resection of obstructive bands was done. All attempts were made to preserve the native valve leaflets. The measurements for the monocusp were taken. The length of the monocusp was the distance from the apex of the RVOT incision to the pulmonary annulus level and the width at the free edge was equal to the circumference of the native annulus [Figure 1]. A monocusp was fashioned from 0.1-mm PTFE membrane, taking care to avoid tapering the edge that is to be sutured to the RVOT. The patch was fixed to the apex of the RVOT incision and the edges were sutured to the muscle using 6-0 polypropylene in a continuous fashion, with the free edge finally apposed to the annulus. Appropriate Hegar dilator was passed to assess the adequacy of the opening. Two surgical hemostat clips were placed at the free edge so as to increase the weight at the region. We believe that this increases the mobility of the monocusp. A liberal transannular patch was placed so as to accommodate the monocusp. Post bypass, RV systolic pressure to left ventricle systolic pressure ratio of <0.7 was accepted. PR was assessed with intraoperative echo (transesophageal or epicardial echo). Transthoracic echocardiography was performed within 5 days of the surgical procedure. Presence and severity of PR were assessed and quantified based on the ratio of the width of PR jet to the width of RVOT. Severity was arbitrarily graded as mild (PR jet width <25% of RVOT width), moderate (PR jet width 25-50% of RVOT width), and severe (PR jet width >50% of RVOT width). , Transpulmonary gradient was assessed using continuous wave Doppler and quantified as mild (<36 mm Hg) and significant (>36 mm Hg). The presence and severity of residual branch pulmonary stenosis were quantified using pulse Doppler. The following dimensions were obtained: pulmonary annulus, main and branch pulmonary arteries, RV end-diastolic area, and RV end-systolic area. Presence and severity of TR were assessed using the area of the TR jet compared with RA area. The mobility of the monocusp prosthesis was assessed visually and notes were made regarding preserved mobile native leaflets. These patients were re-evaluated with transthoracic echocardiography 1 year after the surgery. Severity of PR and progression of PR were assessed. Mobility and calcification of the monocusp valve were looked for. Pulmonary artery and branches and RVOT were also assessed and RV function was assessed using FAC. Changes in electrocardiography in rhythm, PR interval, QRS duration, and presence of arrhythmias were noted. Analysis was performed using the Statistical Package for the Social Sciences (SPSS) software. Continuous variables were presented as mean ± SD and significance of association was analyzed with paired t-test. Categorical variables were presented as percentages and significance of association was analyzed with Fisher's exact test. P value of 0.05 or lower was considered statistically significant. Thirty patients underwent ICR of TOF with transannular patch and monocusp valve reconstruction of RVOT during the study period. Twenty-four patients underwent ICR without placement of a transannular patch during the same period. Median age of the group that underwent monocusp valve reconstruction was 36.5 months (range 3-444 months). Seventeen patients were males. Mean McGoon index was 1.76 in [Table 1]. All of them had narrow pulmonary valve annulus and RVOT stenosis related to malalignment and hypertrophied muscle bundle. Additional narrowing of supravalvar MPA segment was noted in 8 patients, and 11 patients had stenosis of the branch pulmonary arteries. Mean QRS duration before surgery was 86.7 msec (SD 9.59). None had undergone any shunt surgery prior to the ICR. One patient had severe aortic regurgitation due to bicuspid aortic valve (aortic valve repair was done concomitantly) and another one had mitral valve prolapse with moderate mitral regurgitation. One patient had a major aortopulmonary collateral which was treated with coil closure prior to surgery [Table 1]. There was no operative mortality. The mean cardiopulmonary bypass (CPB) time was 176 ± 93.5 min and the mean aortic cross-clamp (ACC) time was 114 ± 28.6 min. Mean CPB time for ICR without monocusp reconstruction during this period was 148 min and the mean ACC time was 95 min. Mean number of inotropes used per patient was 1.48±0.67 for a mean duration of 2.58 ± 0.97 days.The choice of inotrope was dobutamine ± adrenaline. The median duration of hospital stay was 8 days (range 5-44 days). None of the patients had residual VSD. Two patients had RV dysfunction in the immediate postoperative period. Both the patients had only mild PR. One patient was 3 years old with significant malnutrition (weight of 8 kg) and severe cyanosis and recurrent spells prior to surgery, and the other patient had severe left pulmonary artery origin stenosis preoperatively which persisted after ICR. The RV dysfunction of both patients resolved within a few days. Mean RVOT gradient after surgery was 19.1±8.45 mm Hg, with three patients having RVOT gradient more than 36 mm Hg. Eighteen patients had mild PR [Video 1], 10 had moderate PR, and 2 had severe PR [Table 2]. Most of the patients had single jet of PR, with three patients having two jets of PR. Of the 12 patients with more than mild PR, one patient had pulmonary artery branch stenosis and another one had supravalvar MPA stenosis. These patients were not noted to have smaller MPA diameter or any other unfavorable anatomy before surgery. The mean percentage of PR, defined as the ratio of PR jet width to RVOT width, in the immediate postoperative period was 22.54 ± 1.47%. The monocusp valves in all the patients were noted to be freely mobile in the immediate postoperative echocardiograms. Mean QRS duration after surgery was 121.3 ± 15.9. There was no mortality during the study period. None of the patients required reoperation during this period. Mean RVOT gradient 1 year after surgery was 16.8±0.86 mm Hg. At 1 year, PR had progressed [Figure 2] and [Figure 3], with 10 patients having severe PR. Of the 18 patients who had mild PR in the postoperative period, 15 progressed to moderate and 1 progressed to severe regurgitation at 1 year. Of the four patients who had no regurgitation in the postoperative period, three developed mild and one developed moderate regurgitation. The progression to severe regurgitation was more in the 10 patients who had moderate regurgitation in the postoperative period, with 7 of them developing severe PR at 1 year. The two patients who had severe regurgitation in the postoperative period remained asymptomatic at 1 year, with no evidence of RV dysfunction at 1 year. Branch pulmonary artery stenosis was noted in eight patients and one had supravalvar MPA stenosis. Only one patient had RVOT gradient more than 36 mm Hg. This patient had significant gradient (48 mm Hg) at the level of monocusp valve which was calcific and immobile. Mean QRS duration remained the same at 1 year. None had significant arrhythmia or conduction defect other than right bundle branch block [Table 3]. During the follow-up, one patient had culture-negative infective endocarditis with large vegetation attached to the monocusp valve and was successfully treated with antibiotics [Figure 4]. None of the variables like age, McGoon index, presence of pulmonary branch stenosis or supravalvar pulmonary stenosis, MPA diameter, mobility of monocusp valve and/or native valve were found to have any significant association with the progression of PR. Patients with McGoon index <1.5 showed a trend toward more regurgitation in the immediate postoperative period, which was not statistically significant. It was also noted that patients with more residual RVOT gradient had lesser degree of PR, though the values did not have statistical significance. The RV end-diastolic and end-systolic dimensions at 1 year did not show significant increase over the immediate postoperative values, indicating that significant volume overload had not occurred during the study period [Table 4] and [Table 5]. We studied the effect of monocusp valve reconstruction following ICR with transannular patch in 30 patients with TOF. The patients were from a wide age range of 3-444 months, with a median age of 36.5 months. Placement of monocusp valve resulted in abolishing severe PR after surgery in a vast majority of patients. Even though the mean CPB time had increased in these patients due to the additional procedure of reconstructing the RVOT with monocusp valve, it had resulted in favorable hemodynamics due to the reduction of PR. Only two patients had RV failure in the postoperative period, but both were unrelated to the degree of PR. We could not find any anatomical factor consistently associated with significant PR in the immediate postoperative period. At the end of 1 year, however, we found that regurgitation had progressed in most of the patients, with the progression to severe regurgitation being more in the patients who had moderate (7/10) regurgitation than those who had mild (1/18) regurgitation in the postoperative period. The patients who had severe PR were kept under close follow-up to decide on the need for and optimal timing of pulmonary valve replacement. Fibrocollagenous incorporation of the monocusp leaflet is likely a cause of the observed progressive PR. , Differences in function and durability have also been proposed to be the result of technical challenges imposed by the outflow tract into which it is constructed. Studies have reported that the efficacy of valve function depends on an optimal size of the patch: Too large a patch will cause regurgitation, and too small a patch will result in stenosis. It is also important to note that the monocusp valve is implanted without a supporting framework as in prosthetic heart valves and the lack of the frame contributes to early failure. However, the role of other contributing factors like residual stenotic lesions in pulmonary vasculature, which add pressure overload onto the monocusp valve, size of branch pulmonary arteries (small pulmonary arteries result in higher central pulmonary artery pressure after surgery), and mobility of the monocusp in accelerated failure of monocusp valve is not clear. In our study, the monocusp valve was found to be calcific and relatively immobile in 12 of 30 patients. In an in vitro experiment where PTFE valves were implanted in the tricuspid valve position in 12 sheep, macroscopic calcification was detected in seven specimens and always involved the commissural areas. In most cases, the PTFE cusps showed a grossly visible pannus that was thinner and less extensive than usually seen in bioprostheses. There was a complete lack of infiltrating cells within the cuspal material, but the results of the study suggest that the valves had a moderate overall calcification rate. In contradistinction to this study, Turrentine et al,  found no calcification in the membrane, but rather a well-vascularized layer of nonobstructive fibrocollagenous tissue incorporated within the PTFE with focal areas of endothelialization. This fibrous capsule was found to be continuous with the patch and valve and contained extensive neovascularization without evidence of calcification. Function of the monocusp has been reported to persist up to 12 years, though our experience showed that calcification and loss of mobility was seen in a significant number even at 1 year. Even in the presence of functioning, mobile monocusp valve (18/30), five patients had significant regurgitation, indicating that monocusp valve did not effectively prevent progression of PR with advancement of time. However, it should be noted that RV dilation and RV dysfunction were not observed in any of our patients (except in two patients in the immediate postoperative period, which completely resolved prior to discharge), suggesting that abolishment of severe PR by the monocusp valve resulted in a favorable outcome, at least for the relatively short duration of follow up. 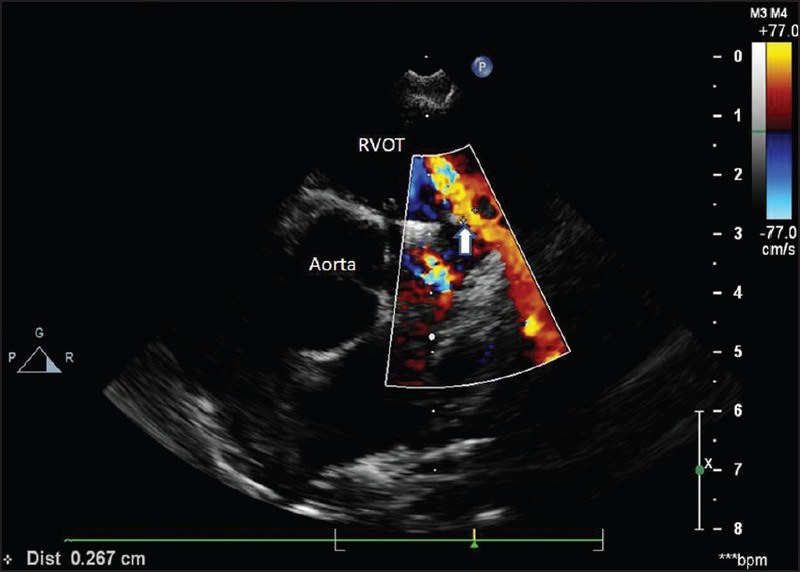 The RV end-diastolic and end-systolic dimensions did not change significantly over 1 year, indicating that the monocusp valve offers good protection against early development of RV volume overload. RV FAC also remained fairly constant throughout the study period and none had evidence of RV dysfunction (defined as RV FAC <0.35) at 1 year. As we could not show an association between any anatomic or physiological variable and progression of PR, we assume that progression of PR is an inexorable process, mainly related to the RVOT dynamics, such as increase in RVOT diameter with time, and also due to lack of supporting framework for the monocusp valve. The sample size was limited and conclusions regarding predictors of adverse outcome cannot be reliably drawn from this small study group. We had no control group to compare the progression of PR with and without monocusp valve reconstruction. Longer follow-up is also required to further evaluate the loss of function of monocusp valve and its contribution, if any, to worsening RVOT gradient and/or PR and to determine the effects of PR on RV size and function. ICR with monocusp pulmonary valve reconstruction reduces immediate postoperative PR. PTFE monocusp valve was found to undergo calcification and loss of function in a significant number of patients at 1 year follow-up. PR also progressed at 1-year follow-up. RV dilation was not observed in any patient at 1 year of follow-up. This study could not identify any predictors of progression of PR, though patients with McGoon index <1.5 showed a trend toward more regurgitation while patients with more residual outflow gradient had lesser regurgitation. 1. Gundry SR, Razzouk AJ, Boskind JF, Bansal R, Bailey LL. Fate of the pericardial monocusp pulmonary valve for right ventricular outflow tract reconstruction. J Thorac Cardiovasc Surg 1994;107:908-13. 2. Turrentine MW, McCarthy RP, Vijay P, McConnell KW, Brown JW. PTFE monocusp valve reconstruction of the right ventricular outflow tract. Ann Thorac Surg 2002;73:871-80. 3. Brown JW, Ruzmetov M, Vijay P, Rodefeld MD, Turrentine MW. Right ventricular outflow tract reconstruction with a polytetrafluoroethylene monocusp valve: A twelve-year experience. J Thorac Cardiovasc Surg 2007;133:1336-43. 4. Muthurangu V, Taylor AM, Hegde SR, Johnson R, Tulloh R, Simpson JM, et al. Cardiac Magnetic Resonance Imaging after stage I Norwood operation for hypoplastic left heart syndrome. Circulation 2005,112:3256-63. 5. Maroto E, Fouron JC, Aké E. Closure of the ductus arteriosus: Determinant factor in the appearance of transient peripheral pulmonary stenosis of the neonate. J Pediatr 1991;119:955-9. 6. Bigras JL, Boutin C, McCrindle BW, Rebeyka IM. Short-termeffect of monocuspid valves on pulmonary insufficiency and clinical outcome after surgical repair of tetralogy of Fallot. J Thorac Cardiovasc Surg 1996;112:33-7. 7. Zoghbi WA, Enriquez-Sarano M, Foster E, Grayburn PA, Kraft CD, Levine RA, et al. 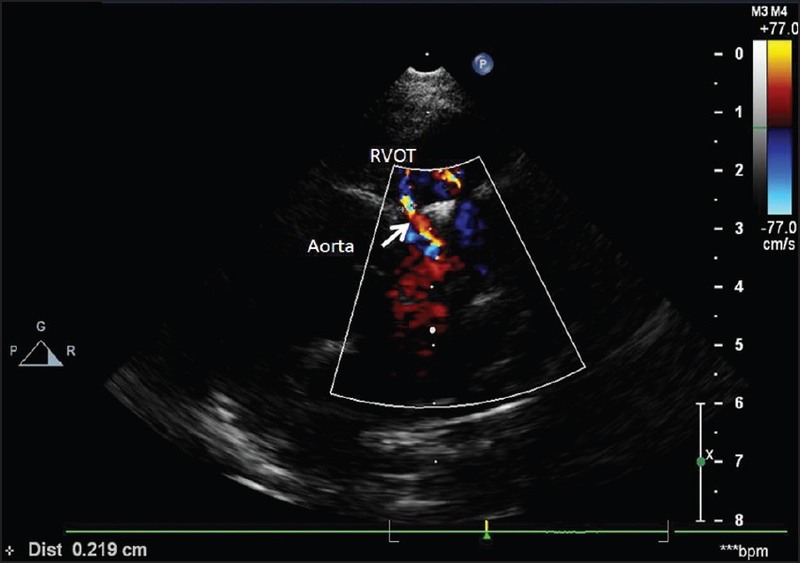 Recommendations for Evaluation of the Severity of Native Valvular Regurgitation with Two-dimensional and Doppler Echocardiography. J Am Soc Echocardiogr 2003;16:777-802. 8. Gundry SR. Pericardial and synthetic monocusp valves: Indication and results. Semin Thorac Cardiovasc Surg Pediatr Card Surg Annu 1999;2:77-82. 9. Bogers AJ, Roofthooft M, Pisters H, Spitaels SE, Bos E. Long-term results of the gamma-irradiation-preserved homograft monocusp for transannular reconstruction of the right-ventricular outflow tract in tetralogy of Fallot. Thorac Cardiovasc Surg 1994;42:337-9. 10. 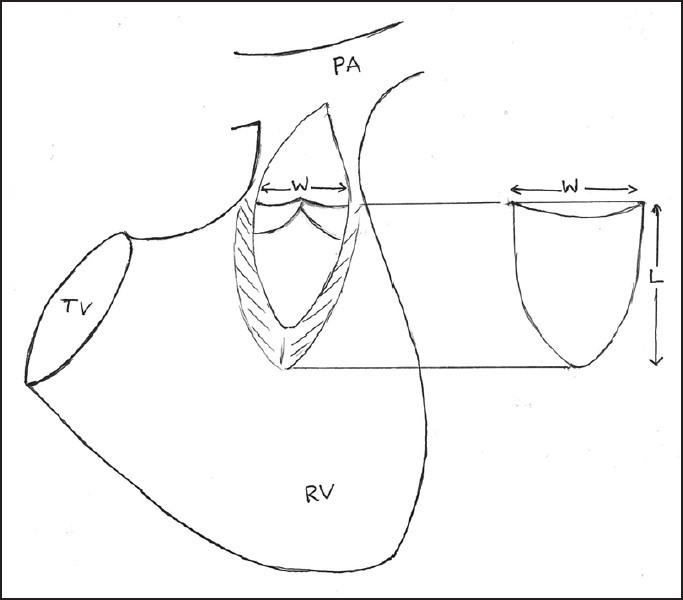 Yamagishi M, Kurosawa H. Outflow reconstruction of tetralogy of Fallot using a Gore-Tex valve. Ann Thorac Surg 1993;56:1414-7. 11. Oku H, Matsumoto T, Kitayama H, Ueda M, Saga T, Shirotani H. Semilunar valve replacement with a cylindrical valve. J Card Surg 1993;8:666-70. 12. Lange R, Weipert J, Homann M, Mendler N, Paek SU, Holper K, et al. Performance of allografts and xenografts for right ventricular outflow tract reconstruction. Ann Thorac Surg 2001;71(Suppl 5):S365-7. 13. Warner KG, O'Brien PK, Rhodes J, Kaur A, Robinson DA, Payne DD. Expanding the indications for pulmonary valve replacement after repair of tetralogy of Fallot. Ann Thorac Surg 2003;76:1066-71. 14. Chard RB, Kang N, Andrews DR, Nunn GR. Use of the Medtronic Freestyle valve as a right ventricular to pulmonary artery conduit. Ann Thorac Surg 2001;71(5 Suppl):S361-4. 15. Welters MJ, Oei FB, Witvliet MD, Vaessen LM, Cromme-Dijkhuis AH, Bogers AJ, et al. A broad and strong humoral immune response to donor HLA after implantation of cryopreserved human heart valve allografts. Hum Immunol 2002;63:1019-25. 16. Scavo VA Jr, Turrentine MW, Aufiero TX, Sun K, Binford R, Carlos G, et al. Monocusp valve and transannular patch reconstruction of the right ventricular outflow tract: An experimental study. ASAIO J 1998;44:M480-5. 17. Vogt PR, Genoni M, Kunzli A, Turina MI. Cryopreserved homograft monocusp valves for reconstruction of the right ventricular outflow tract [Letter]. J Thorac Cardiovasc Surg 1997;113:423. 18. Iemura J, Oku H, Otaki M, Kitayama H. Expanded polytetrafluoroethylene monocuspid valve for right ventricular outflow tract reconstruction. Ann Thorac Surg 2000;70:1511-4. 19. Nistal F, Garcia-Martinez V, Arbe E, Fernández D, Artiñano E, Mazorra F, et al. In vivo experimental assessment of polytetrafluoroethylenetrileaflet heart valve prosthesis. J Thorac Cardiovasc Surg 1990;99:1074-81. 20. Gatzoulis MA, Till JA, Somerville J, Redington AN. Mechanoelectrical interaction in tetralogy of Fallot. QRS prolongation relates to right ventricular size and predicts malignant ventricular arrhythmias and sudden death. Circulation 1995;92:231-7. 21. van Huysduynen BH, van Straten A, Swenne CA, Maan AC, van Eck HJ, Schalij MJ, et al. Reduction of QRS duration after pulmonary valve replacement in adult Fallot patients is related to reduction of right ventricular volume. Eur Heart J 2005;26:928-32. 22. Latus H, Gummel K, Rupp S, Valeske K, Akintuerk H, Jux C, et al. Beneficial effects of residual right ventricular outflow tract obstruction on right ventricular volume and function in patients after repair of tetralogy of Fallot. Pediatr Cardiol 2013;34:424-30. 23. Kilner PJ, Balossino R, Dubini G, Babu-Narayan SV, Taylor AM, Pennati G, et al. Pulmonary regurgitation: The effects of varying pulmonary artery compliance, and of increased resistance proximal or distal to the compliance. Int J Cardiol 2009;133:157-66. 24. Spiewak M, Biernacka EK, Malek LA, Petryka J, Kowalski M, Milosz B, et al. Right ventricular outflow tract obstruction as a confounding factor in the assessment of the impact of pulmonary regurgitation on the right ventricular size and function in patients after repair of tetralogy of Fallot. J Magn Reson Imaging 2011;33:1040-6. 25. Yoo BW, Kim JO, Kim YJ, Choi JY, Park HK, Park YH, et al. 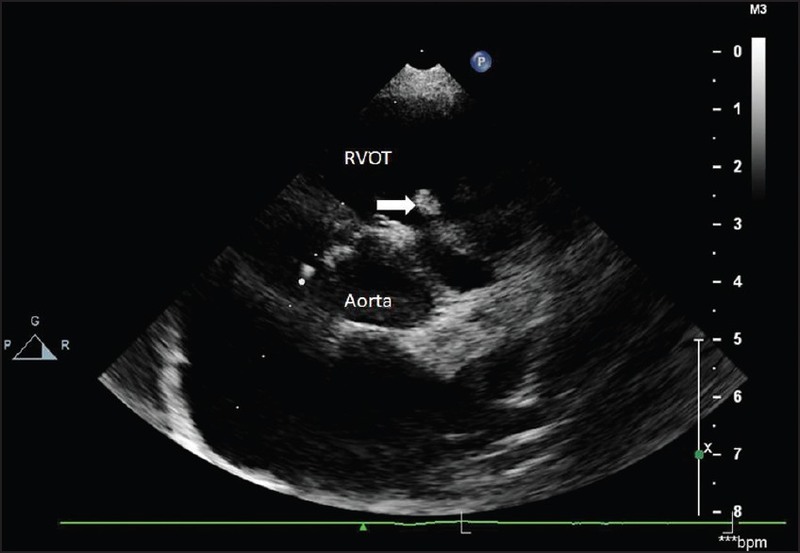 Impact of pressure load caused by right ventricular outflow tract obstruction on right ventricular volume overload in patients with repaired tetralogy of Fallot. J Thorac Cardiovasc Surg 2012;143:1299-304.